The Fireball ride broke apart on the first day of the 2017 Ohio State Fair, killing one man at the scene. A woman died from her injuries months later. As the second anniversary of the deadly Ohio State Fair accident approaches, the state’s new Director of Agriculture is pushing new rules for ride manufacturers and operators. forcing ride operators to confirm safety information from the ride's maker has been passed on to state inspectors. deeming some rides as needing more inspections. giving operators two weeks to fix issues identified by inspectors. The Agriculture Department can make some rule changes on their own, while others need to be made by Ohio lawmakers. 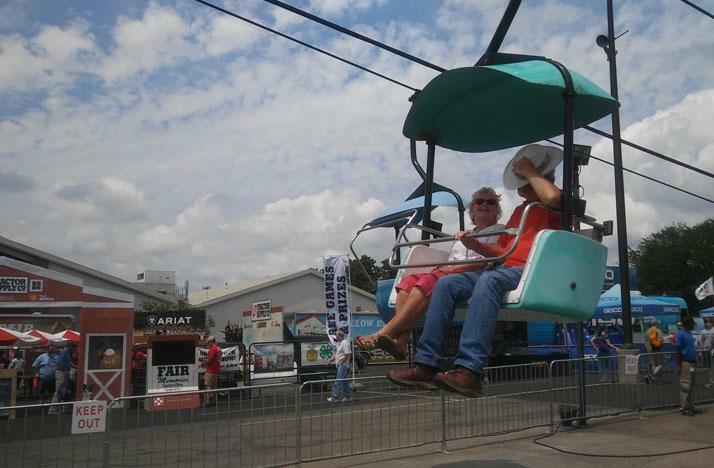 Pelansa announced the proposed rules on March 14, the same day The Columbus Dispatch reported fair officials withheld a letter containing safety warnings about the SkyGlider ride from inspectors last year. An Ohio State Fair spokeswoman says nothing was done last year to address potential problems with the ride because the manufacturer's president died shortly after issuing the warning. Pelanda took office months later after being appointed by new Gov. Mike DeWine. But she says the timing of the announcement and the Dispatch’s reporting was a coincidence. "It was really kind of a simultaneous thing in terms of understanding what we needed to do to provide safety to the public," Pelanda says. An investigation concluded that corrosion was to blame for the fair's spinning and swinging Fire Ball ride breaking apart in July 2017, killing an 18-year-old man, a 19-year-old woman and injuring several others. State law says the agriculture director can change or add rules after the industry-controlled Advisory Council on Amusement Ride Safety reviews them and makes recommendations. Pelanda also is requesting a 26 percent increase in the Ride Safety Division's budget to $1.8 million. "Going forward, I think the changes we are going to make by rule and legislation, are going to help better ensure the safet of rides for all people, whether they’re at our fairs, whether they’re at our water parks, or whether they’re in our bounce houses," Pelanda says. This article first appeared on WOSU. For more stories like this, visit wosu.org. Ohio State Fair officials have announced this year's concert lineup, and it includes a mix of everything from classic rock and R&B to country and comedy. The Ohio State Fair will have a new ride provider next summer after a fatal ride malfunction in 2017. Talley Amusements from Forth Worth, Texas begins a four-year contract to provide rides for the Ohio State Fair in 2019, according to fair officials. Attendance at the Ohio State Fair has been up compared to last year, when fair officials were dealing with the fallout from a deadly ride accident.